On 31 July 1965, TF 115 under NAFG was activated when TF 71 was deactivated by ComSeventhFlt. CinCPacFlt, through ComSeventhFlt, retained the logistic support responsibility for TF 115. RADM Ward, CTF 115 and CHNAG, added another patrol area off the coast of MR-4, which made a total of 9 patrol areas, each 30 to 40 n. mi. deep and 8 to 120 n. mi. long, with one DER in each area (Figure 8) or an MSO or MSC if not enough DERs were available. 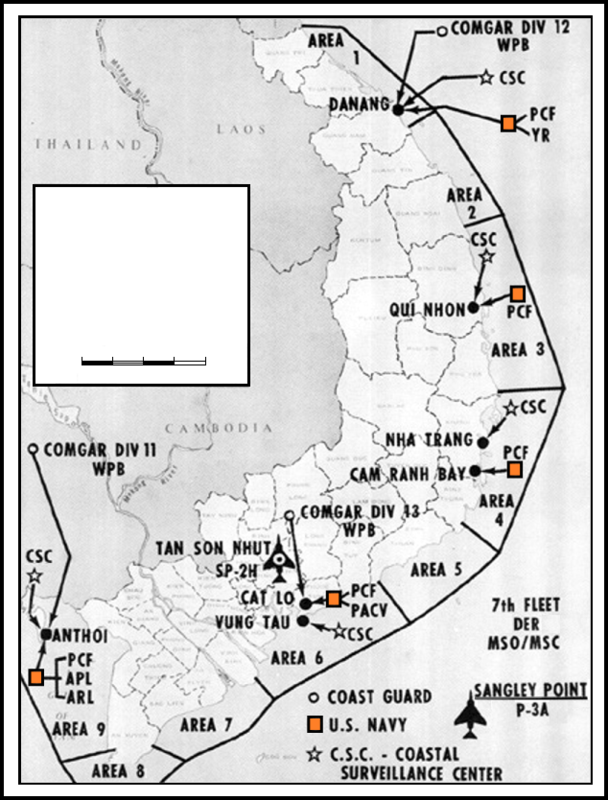 U.S. Navy Market Time operations were controlled from CTF 115 surveillance operations center in NAG headquarters, Saigon, while the VNN patrol operations were coordinated with U.S. Navy operations from the CSCs. After the transfer of operational control of Market Time from ComSeventhFlt to CHNAG in July, there were no further major changes until the September conference in Saigon. There, the conferees discussed, among other topics, ComUSMACV's recommendation that additional patrol ships be made available to Market Time to increase the number of offshore patrol stations continuously manned from 9 to 25. The conference was attended by representatives from CinCPac, CinCPacFlt, OPNAV, and NAG. A study was conducted, refining the concept of operations for Market Time and recommending adjusted force levels based on the best available information of the nature of the threat. ​That study (Landis Study) estimated that the VC needed to infiltrate 14 tons per day to maintain their level of operations.1 If the 14 tons were supplied by sea, they could have been moved by one 100-ton-capacity vessel every 7 days, by 28 junks of ½-ton capacity each day, or by combinations of the two. It was decided that the aspect of the threat most difficult to interdict--infiltration and transshipment by junks--should be the basis for developing a concept of operations. It was further determined that a 20-percent attrition would be unacceptable to the enemy. With increased force levels to achieve this attrition, it was assumed that Market Time would have a substantial capability against steel-hulled trawlers. The study group suggested establishing 3 barriers--an air barrier and outer and inner surface barriers. The air barrier was to be flown with 2 tracks manned continuously. The Red Track was usually flown by P-2s from Tan Son Nhut or P-5 seaplanes, and the Blue Track by P-3s from Sangley Field in the Philippines (Figure 6). Both tracks consisted of one leg over the coast and the other 40 n.mi. offshore. 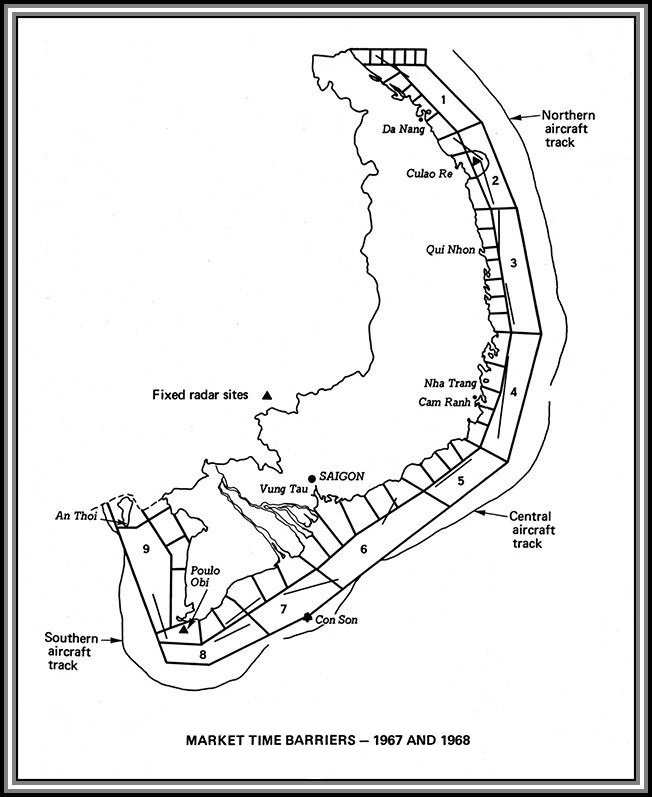 In addition, small single-engine aircraft (L-19s) made two daily flights over the coastline; aircraft with sidelooking airborne radar flew intelligence and night missions; and a Vietnamese C-47 flew two to three surveillance flights a week over area 9 near the Cambodian border. MARKET TIME forces, commanded by CTF 115 with headquarters in Saigon, continued to maintain barriers at the 17th parallel and on the Cambodian border to halt communist infiltration. In addition, patrols were maintained along the entire coast. Larger ships (DERs, MSCs and MSOs) typically operated 5-20 miles at sea. Smaller craft (PCFs and Coast Guard WPBs, as well as South Vietnamese junks) operated close inshore. Often these shallow water patrols were vectored to suspicious targets by the larger ships. In addition, patrol aircraft stationed in-country or in the Philippines flew daily tracks over the coastal zone. Two AKLs provided logistic support for MARKET TIME forces. During March, an average of 34 U. S. ships were on daily MARKET TIME patrol. In addition, 9 Vietnamese Sea Force ships and 189 junks were underway daily. Coordination between the United States and Vietnamese forces was exercised by jointly manned Coastal Surveillance Centers at Danang, Qui Nhon, Nha Trang, Vung Tau and An Thoi. In addition, U. S. naval advisors were assigned to Vietnamese junk divisions and sea force ships. Since March 1965, MARKET TIME forces have operated under rules of engagement allowing any vessel (less warships) to be stopped, visited, and searched within the three-mile limit. Within the contiguous zone stretching three to twelve miles from the coast, U.S., ships can demand identification and a declaration of intent from ships of any nation, except for warships. In international waters outside the 12-mile limit, U.S., forces may stop, visit, and search any vessel of South Vietnam. [Source: From the collections of the Naval History and Heritage Command.